An aspect of water level of significance to the ecology of the marsh is how water, soil, and sediment interact at Kawai Nui. What does the daily water level record say about saturation of the soils and maintenance of open bodies of water on the marsh? This question is far more complex than might first appear. Kawai Nui is a layered system (see description under geology), and much of it can be described as a shallow lake covered by a floating mat of vegetation. However, this description is an over-simplification. A discussion of water/solids interactions in Kawai Nui is presented elsewhere. Here we present the manual measurements of water level made at a metal staff gage set up in one of the ponds at Na Pohaku o Hauwahine. Graphs on this page show recent and typical water level measurements; Archived water level readings for this staff gauge are provided elsewhere. The elevation scale on graphs marked as "corrected" has been adjusted using an ongoing comparison with a USGS gauge on the opposite side of the marsh. This comparison allows us to apply a correction factor which puts our "corrected" elevation within an inch or less of true elevation above MLLW. The graph to the left includes daily rainfall amounts as vertical blue lines. The scale (y-axis) for these values is read in inches. Rainfall measurements come from a manually read rain gage located on the hill above the marsh at Na Pohaku o Hauwahine. After 1 year of measurements (January 2002 - January 2003) we can conclude that overall, variability in water level is not great. Typically the water level stands at around +3 feet. Our measurements made through 2002, however, are insufficient to assess drought conditions. Further, rainy periods induce a rise in water level that can be relatively sudden and exceed +4 feet (see "Wet Season" below and February 15, 2003 on graph above). While much of this water is lost (flows out of the marsh) within a few days, water level can remain elevated for weeks. Although rainfall measurements presented are from a gage at Na Pohaku o Hauwahine, located near the middle of the marsh, the water level of the marsh is more dependent upon rainfall in the wetter, upper watershed (Maunawili Valley). 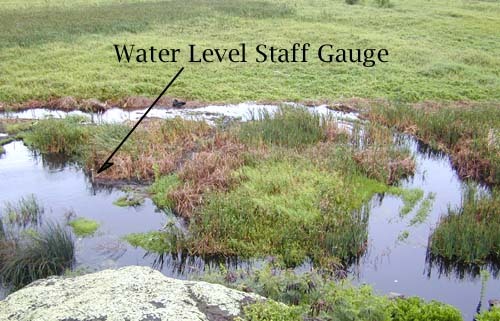 We expect that local runoff will elevate the water level around the staff gauge (located on a pond with a restricted connection to the remainder of the marsh) within a period of hours or less. Then, a rise in the water level of the marsh generally will occur after a longer period of time, as rainfall in Maunawili Valley drains via streams into the marsh. The difference between the local effect and the general water level rise is not seen in these data, in part because water level is not recorded continuously. The point is, that rainfall induced peaks cannot be interpreted as representing water level across the entire 800+ acre wetland. With a decline in rainfall into the dry season, the marsh is seen to gradually lose water. After a small, but sharp rise in water level resulting from an unseasonable rainfall on July 29-30 (2.25 inches at Na Pohaku), the water level in the marsh declined steadily in 2002 at an average rate of -0.009 ft (-2.8 mm) per day through October 14. Change in water level results from the balance between stream, spring, and runoff inflows (+) and water loss due to outflow and evaporation (-). Additional water level information is available for three gauges operated by the U.S. Geological Survey (see USGS data presentation. Data display of recent recorded water levels are excellent, but the elevations given are either incorrect or arbitrary. The gauges are all located on Oneawa Channel or its extension draining the marsh on the mauka side of the levee. All of the locations, except the southern-most (16264600-- Kawainui Marsh near levee sta. 15+00), show a tidal influence, which indicates they are not monitoring water level in Kawai Nui Marsh, but in Oneawa Channel. The graph above compares staff gauge readings made at Na Pohaku o Hauwahine with the nearest reading (readings are reported every 15 minutes) at USGS Gauge No. 16264600 in Kawai Nui Marsh at the south end of the levy. Several sudden changes in water level readings during this period call into question the calibration of the instrument. However, the dry season pattern of water level changes follows the Na Pohaku o Hauwahine readings reasonably closely, at least until the end of August when the USGS gauge appears to get hung up (water level remained constant for most of September). During this period of comparison, there was only one rainfall event resulting in a clear rise in the water level at Na Pohaku o Hauwahine (that of July 30-31). A distinct water level rise was also recorded at the USGS gauge, but with a peak on August 3. This lag is thought to be a reflection of either the local vs. general water level change between Na Pohaku and the marsh as a whole, or the time it takes for an incoming wave of water to peak downstream from Na Pohaku, or some combination of these effects.